The global content analytics market has seen remarkable growth over the last few years due to the growing importance of the field in economic dynamics. Increasing competition in several key application sectors is likely to be a prime driver for the global content analytics market in the coming years. The content analytics market is centered on developed Western economies, where the use of data analytics protocol begun much earlier than in emerging economies. However, rising economies in regions such as Southeast Asia and the Middle East are likely to play a prominent role in the development of the global content analytics market in the coming years due to their rising commercial potential. According to Transparency Market Research, the global content analytics market was valued at US$2.5 bn in 2017 and is likely to rise to more than US$8.1 bn by 2022. The market is expected to exhibit a strong 26.1% CAGR in the coming years. Of the various types of content analytics, text analytics dominates the global content analytics market due to its growing use in SMS and social media analytics. The text analytics segment accounted for 24.3% of the global content analytics market in 2017 and is likely to remain similarly dominant in the coming years thanks to the steady rise in its demand. The segment was valued at US$620.33 mn in 2017 and is likely to account for US$1,783.9 mn by 2022, exhibiting a 23.5% CAGR. The growing demand for digitalization in the government sector is likely to remain a major driver for the global content analytics market in the coming years. The government sector presents immense scope for the content analytics market due to the rising emphasis of digital identity systems put by a number of rising countries and the growing push to digitalize population records. National security systems are likely to play a key role in the global content analytics market in the coming years due to the rising threat of terrorism and the growing use of social media and other technological advancements in the communication sector by terrorist groups. Geographically, North America is the dominant segment of the global content analytics market and accounted for US$787.1 mn in 2017. The North America content analytics market is expected to exhibit a robust 26.5% CAGR over the 2017-2022 forecast period to grow to a valuation of US$1,783.9 mn. The North America content analytics market benefits from the widespread acceptance of digital resources in the economic ecosystem in developed countries such as the U.S., which has led to growing generation of digital content. The strong presence of market leaders such as Microsoft Corporation, Google Inc., Oracle Corporation, and IBM is also crucial for the North America content analytics market, whch is likely to retain steady dominance in the global content analytics market in the coming years despite promising growth prospects in APEJ and MEA. The Europe content analytics market is likely to account for 26% of the global market by 2017 end, while Japan is expected to account for more than 11%. The solid contribution from these regions is likely to be vital for the global content analytics market in the coming years, as the growing technology sector in Japan has led to growing need for content analytics, while the Europe market is driven by the strong presence of digitalized resources in Western and Central Europe. The moderately fragmented global content analytics market is dominated by companies such as Google Inc., Microsoft Corporation, IBM, SAS, SAP, Oracle Corporation, Adobe Systems, HPE, OpenText Corporation, and Nice Systems. The global content analytics market report provides a comprehensive look at the market to make readers familiar with the market’s operating dynamics. The report takes a close look at the segmentation of the content analytics market to provide readers with a clear picture of the leading entities in the market. All aspects of the content analytics market are studied in the report to provide readers with a complete analysis of the growth prospects of the market. The comprehensive analysis of the market provided in the report makes it a must-have accessory for content analytics market players to prosper in the market in the coming years. 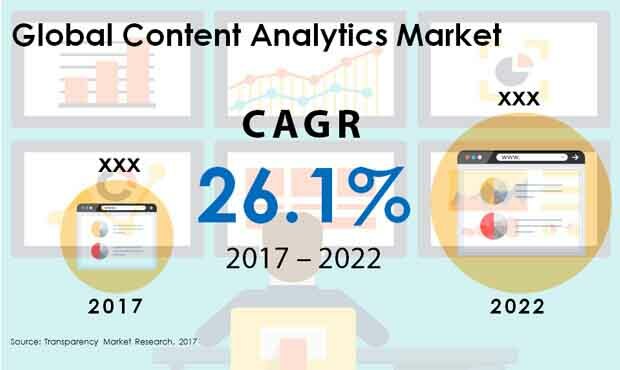 The various drivers and restraints affecting the global content analytics market are profiled in the report to provide readers with a clear picture of the forces determining the growth rate of the content analytics market. The global content analytics market was valued at US$2.5 bn in 2017. Exhibiting a robust 26.1% CAGR between 2017 and 2022, the market is expected to rise to more than US$8.1 bn by 2022. Leading drivers and restraints affecting the global content analytics market are assessed in the report. This helps provide readers with an accurate picture of how various factors interact with the content analytics market and which are likely to play a determinant role in the growth of the content analytics market in the coming years. Major trends likely to have a lasting impact on the content analytics market are studied in detail in the report, giving readers a comprehensive picture of the growth trajectory of the market. The economic and regulatory landscape of the content analytics market is also described in brief to give readers an idea of how these external factors are likely to affect the market in the coming years. The report devotes a major part of its discussion to analyzing the hierarchy of the content analytics market by various parameters and profiling the leading contributors to the market. Key segments of the content analytics market are profiled in the report in order to inform readers about the dominant revenue channels of the content analytics market, giving them a clear idea of which segments present significant promise for investment. By application, text analytics is likely to remain the dominant segment of the global content analytics market in the coming years. The text analytics segment was valued at US$620.3 mn in 2017 and is expected to rise to US$1,783.9 mn till 2022, exhibiting a robust 23.5% CAGR over the 2017-2022 forecast period. Social media analytics and speech recognition and language analyzers are also likely to remain important to the global content analytics market in the coming years due to the growing role of these tools in developing a business in the modern economic landscape. Geographically, North America is likely to remain the leading regional segment of the global content analytics market in the coming years. The North America content analytics market is expected to exhibit a robust 26.5% CAGR from 2017 to 2022 to rise from a valuation of US$787.1 mn to US$2,547.5 mn over the forecast period. Leading companies in the global content analytics market include Google Inc., IBM, Microsoft Corporation, Oracle, SAS, OpenText Corporation, Nice Systems, Adobe Systems, HPE, and SAP. The report presents a comprehensive picture of the competitive dynamics of the global content analytics market in order to acquaint readers with strategies that have seen consistent success in the content analytics market.